Yes, we're all a little bit excited about this new Unreal Tournament game, but no one expected gameplay footage to pop up this soon. The video above shows the Epic team embarking on their first Unreal Tournament 2k14 deathmatch, and while the game is very clearly in its early stages (the environment is a bunch of grey cubes under a generic blue skybox) it's still nice to see it in action. One guy even manages to pioneer cheating in Unreal Tournament 2k14. Well done, guy. 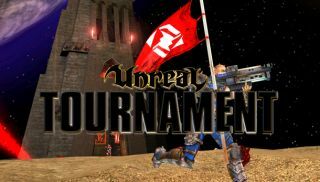 Epic Games announced the new free-to-play Unreal Tournament earlier this month, along with news that development on the title was starting that same day. Unusual, yes, but it's in keeping with the spirit of the title, which Epic Games hopes will be a collaborate process. “From the very first line of code, the very first art created and design decision made, development will happen in the open, as a collaboration between Epic, UT fans and UE4 developers,” Epic said .